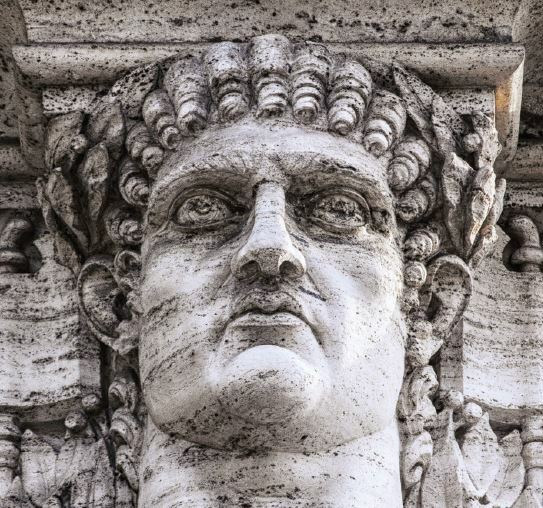 Nero – the last emperor of the Roman Empire – is best remembered as the man who fiddled while Rome burned. I see a direct parallel to the collective of current world leaders who are ignoring vital threats to our very survival while fiddling with far less important issues – mostly to do with the creation of short-term economic growth or greater world dominance. I will cite two recent publications to make my point. The first is a study by Dr Graham Turner of the University of Melbourne revisiting the famous Limits to Growth (LtG) study of 1972 and comparing its global computer model projections with actual developments over the subsequent forty years . The original study was rather controversial. Many pundits interpreted it as a “doomsday” report. Others pronounced it as a failure because we did not run out of oil by 2000. Most commentators totally misread what the report actually said. It did, in fact, not make any predictions; rather it computed a number of scenarios based on various assumptions. The most interesting scenario is probably the one the authors called the “standard model” which projected what would likely happen in a business-as-usual scenario with industrial production, pollution, population, food supply, and resources. These are all dynamically linked with many feedback mechanisms in the LtG model. 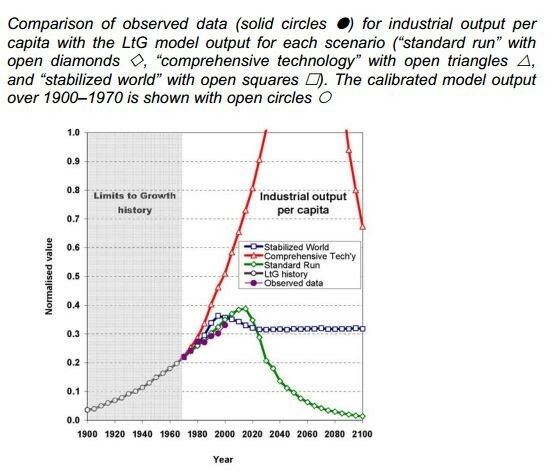 What Dr Turner found was that the actual data since 1972 track very closely with the LtG “standard model” in all areas: Industrial production, pollution, population, food supply, etc. His study drew on extensive data from United Nations statistics, the BP Statistical Review, the US National Oceanic and Atmospheric Administration, and other reliable sources. The second publication is the IPCC Climate Mitigation report of April 2014 . The diagram below sends a very clear and sobering message: In spite of the Kyoto Protocol goal of reducing CO2 emissions by 7% from 1990 to 2012, and in spite of other promises of climate action, total emissions continue to rise inexorably each year. In the period 1970-2000, the annual increase was 1.3%. From 2000 to 2010, the rate increased to 2.2% per annum. 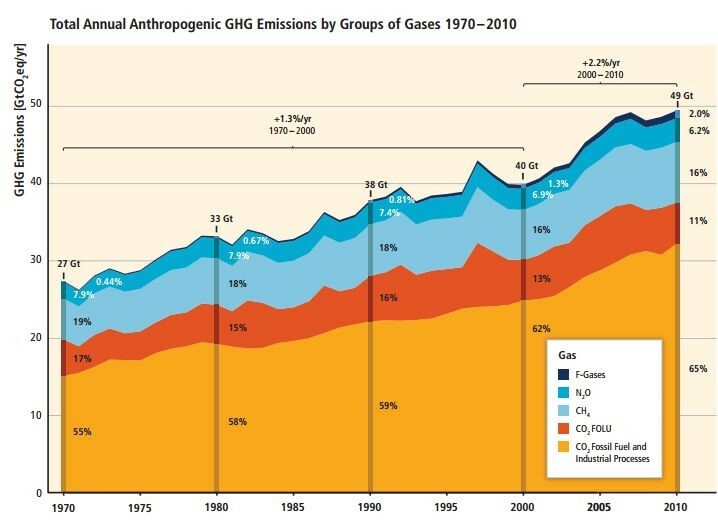 The actual increase for the period from 1990 to 2010 – when we should have been reducing emissions – was almost 30 %. The IPCC report is totally consistent with the LtG “standard model”. We are on a catastrophic business-as-usual path, essentially doing nothing to change the state of affairs. Rome is burning while our leaders are fiddling. The questions I want to deal with here are why is this being allowed to happen and what may we do about it? In my opinion, the answer probably lies in the increased influence of the business community on politicians. This has been going on for about thirty years now as a result of the dominance of neoliberal economics. This economic paradigm – and in particular the rules of the WTO – gives free reign to multinational corporations to pretty much do as they please: Produce their products in Asian sweatshop nations without any regard for environmental or social consequences; use transfer pricing and tax shelters to avoid paying taxes where they sell their products; and undercut more environmentally responsible products from local companies that do not share these advantages. Due to their vast size, these corporations always have the ear of leading politicians who, in turn, vie for their favours: “Please invest here. Please create jobs.” Nation states are reduced to competitors for the favours of the 0.1% who own the majority of these behemoths and whose wealth has exploded under neoliberalism. Nation states are forced to cut back on welfare in order to pay their pound of flesh. Around 300 multibillionaires now own as much as the 3 billion poorest citizens of the world. Another result of neoliberalism is the increasing dominance of financial speculation relative to investments in the real economy. Recent figures from the UK show that only 8% of bank lending goes to the real economy while the rest goes to speculative purchases of existing assets. The pattern is the same everywhere and this is why we will continue to experience asset bubbles. The situation is worst in the USA where the “corporatocracy” has actually purchased Congress outright. Democracy has effectively been eliminated from the equation. The situation in Europe is marginally better but subject to the same forces. In the European Union, no major legislation is possible if it goes against the express wishes of the major industrial corporations. Hence the failure of the EU Emissions Trading System, among other things. Rejection of neoliberal economics and leaving the WTO to form an alternative trading block based on good governance and sustainability (environmental, social, and economic). These are some of the suggestions I put forward in Occupy World Street . However, realistically speaking, this is not likely to happen until after the green curve above turns south and we have a totally new situation. Once we are there, existential necessity rather than corporate wish lists will determine the course of events. In the meantime, the best hope for avoiding a collapse is for the business community to realise that its own interest is best served by taking radical action before it is too late. The siphoning off of wealth from the real economy, from the welfare state, from developing countries, and from ordinary citizens has been so successful for the 0.1% that many ordinary workers can no longer afford to purchase the products they make. If the business community does not act decisively, then they will go down along with the rest of us. One key thing that the business community could do is to tell their politician friends that the time has come for an effective climate solution. I am not talking about more “reduction targets” and more voluntary schemes like Kyoto. By now, we all know that they do not work. Rather, I am talking about putting an absolute ceiling on CO2 emissions, with subsequent annual declines. That is the only way to prevent overheating of the planet. Several well thought out schemes exist, although they are not on the table for discussion in the COP meetings yet. But they could be. In Occupy Wall Street, I have put forward one such proposal that is fair and will work. I have also referred to two other similar proposals that would also work. The positive thing about this approach is that a high price on carbon will provide the incentive for private investment in new technologies that will be environmentally friendly. We can put to work the enormous innovative potential in the private sector for solving real problems instead of the current focus on asset speculation. Think of the enormous potential of getting all that speculative money back into the real economy. So this is my message to the business community: Get real, real fast. Graham Turner and Cathy Alexander, “Limits to Growth Was Right: New Research Shows We’re Nearing Collapse”, The Guardian (UK), September 2, 2014. “Summary for Policymakers” in “Climate Change 2014, Mitigation of Climate Change”, IPCC, April, 2014. Ross Jackson, “Occupy World Street: A Global Roadmap for Radical Economic and Political Reform”, Chelsea Green, 2012.